This is a sponsored post written by me on behalf of Tetra Pak for SocialSpark. All opinions are 100% mine. The other day, we were walking home from the park eating some leftover Easter candy and my 4 year old tossed his empty package onto the sidewalk without thinking twice. The mom in me stopped our walk and told him he had to pick it up, and put it in the stroller. Totally normal kid thing to do, even I remember doing that when I was little! I saw a perfect teaching moment on littering and taking care of the Earth, and it got me thinking about practical preschool recycling activities that would introduce where products come from, how they are made, and how they can be reused. We are pretty big recyclers around here, and I want my kids to start learning about what happens to things after we use them! My kids love learning how things are made (thank you Mr. Rogers! ), how things are recycled, and where garbage trucks take everything we toss. Preschool recycling activities don’t just have to be crafts, they can be small everyday habits too. In addition to recycling, kids can learn to use less and upcylce things! Here are some ideas. Donating used toys and clothes to Goodwill rather than tossing. I explain why we always have a “giveaway bin” instead of just throwing items away. Having a rain barrel to catch water for outside activities like their water table, rather than running the hose as much. Turning off the sink while they brush teeth. Opening the curtains when possible instead of turning on the lights. Helping mom pick out food that that comes in environmentally friendly packaging like Tetra Pak cartons. Instead of tossing coffee grounds, or fruit and veggie scraps, you could start a compost. Reuse paper bags as wrapping paper, and let kids color the package. Take reusable bags to the grocery store. My son gets the special job of carrying them in to the store. Reuse cardboard boxes for toys like play houses, cars, rockets, etc. This is great for an imagination too, to essentially get used to making toys instead of buying them all the time. Buying used clothes when I can, and mending small holes rather than quickly tossing. It’s a powerful thing for kids to see parents shopping at thrift stores. Color on the inside of cereal boxes, or used envelopes. Use egg cartons or Tetra Pak cartons for planting seedlings. No need to buy extras. Make a bird feeder out of a used Tetra Pak carton or a milk jug. Reuse packaging as filler for sending mail. (These are Tetra Pak cartons repurposed here). Let them put the recycling in the bins or sort it. Watch YouTube videos on what landfills look like as well as recycling plants so they know where garbage goes. Mr. Rogers and Reading Rainbow have episodes on reusing old things and recycling, which are great for showing kids ways to reuse and recycle things like glass bottles! Letting the kids act out garbage and recycling trucks, with ones like these. I found this activity book on Amazon that had 5 star reviews across the board! It is full of step by step instructions on how to make new toys out of things you likely already have around the house, including trash and recycling. 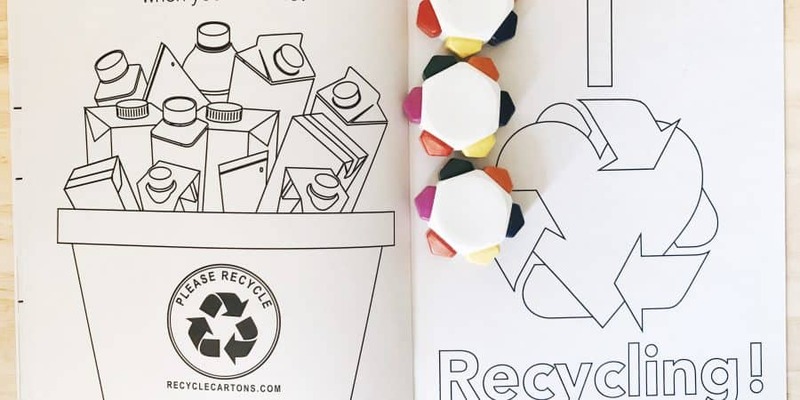 Find fun activities like the Tetra Pak coloring book below that talk about recycling. Lately we have been learning about a new kind packaging that practices sustainability! 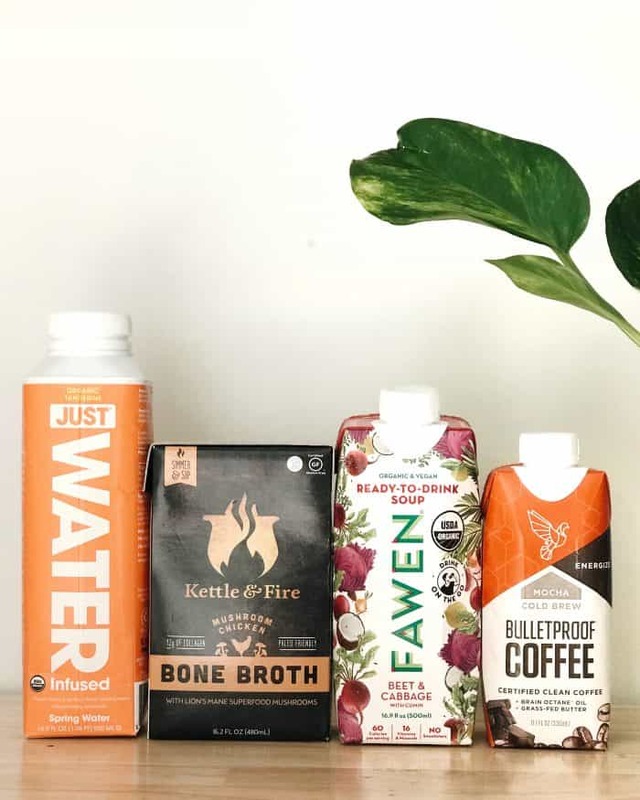 We got these delicious food and drinks made with Tetra Pak packaging which have really fascinated my kids because they look different than other packaging. And better yet, they are different. Tetra Pak Cartons are made from renewable materials from sustainable sourcing. 100% of the paperboard used in the cool cartons can be traced to responsibly managed forests. 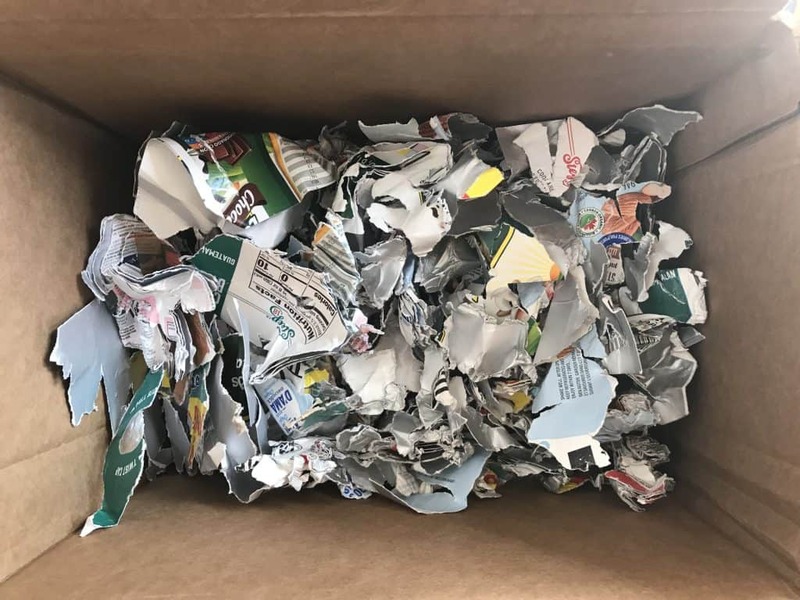 And, after a carton is recycled it get’s turned into other things like tissue, or paper products. It’s a great alternative to plastic, and doesn’t compromise the environment, food quality, convenience, or durability. Their motto is ‘Protect What’s Good’! I feel good about giving my kids food from the Tetra Pak cartons, as they don’t require preservatives or additives to keep a long shelf life, and it’s BPA free. The packaging is awesome for on the go or camping, and no refrigeration required, until opened. 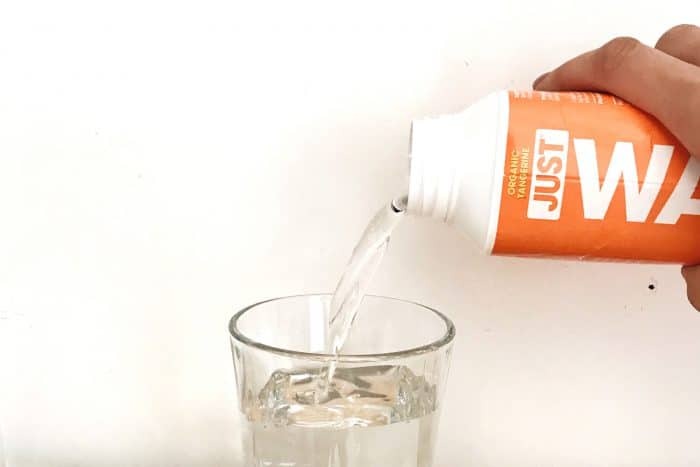 It meets environmentally friendly manufacturing standards, and the whole package can be recycled including any straws or caps. It’s a privilege to live in a clean country. I remember how shocking it was for me the first time I lived in a small poor village in the Dominican Republic where there was no system set up for garbage or recycling. I saw trash everywhere. At best people dug holes in their yards to contain it. Thankfully we have systems and products in place here that allow us do our part to protect what’s good. It can be through reducing waste at home, teaching kids to reduce reuse and recycle, or even choosing what products to buy that model sustainable practices. Preschool recycling activities don’t just have to be arts and crafts but can be every day life. As they get older, they can learn more about the Earth, and how to be better stewards of it. What activities do you do in your home to teach kids to reduce, reuse and recycle? Share it in the comments! This is such a great post! 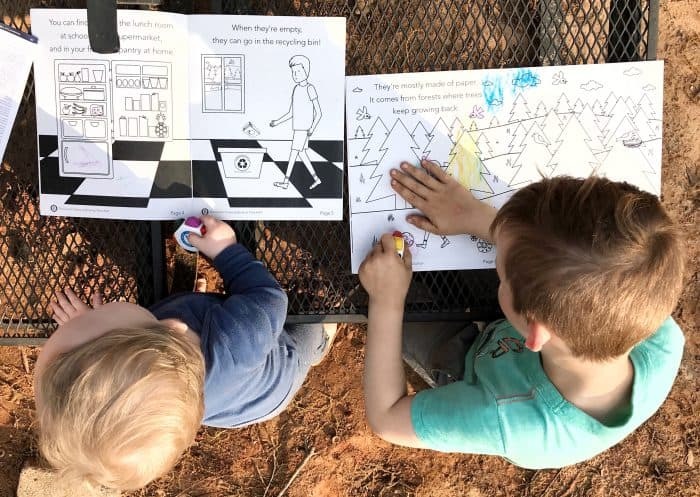 I love how you consider the big picture – WHY we recycle, why it’s important and instilling habits in addition to the fun arts and crafts kids to from time to time. Thanks! Hi Jenn, yes the big picture is what I’m hoping to teach them! Kids are so smart and they are always watching mom, which is why I’ve focused more on daily habits that are Earth friendly than just a craft here and there. Eventually they will want to know more details, but I think this list is fairly age appropriate! My twin boys are in preschool and it is the perfect time to start teaching them about recycling. I knew about Tetra packaging but not that they were made from renewable materials! Hi Tal, yes their packaging is made from renewable materials! Sustainability is very important to them. Hope you enjoy some of these preschool recycling activities with your twins! I like the idea of a “giveaway bin.” I’m having trouble explaining to my 4 year old why I am taking some of her unused toys but giving her the idea to give some of the toys she doesn’t use to people less fortunate could help. I also haven’t heard of tetrapak cartons. Thanks for the great information! Maria, I highly recommend a giveaway bin. I keep ours out of reach of the kids, because they keep taking things out. They also see us drop it off at a thrift store. One thing that has helped with giving away older toys is to allow them to pick up a new toy at a thrift store. That way, it doesn’t break the bank, we are “reusing” rather than buying new which more Earth friendly, and it’s easier to give away again if I didn’t spend much on it. Also, now that you know about Tetra Pak Cartons you will start recognizing them on the grocery shelves! Thanks for reading about these preschool recycling activities! Hi Rose. Yes they can get so excited about turning old things into something new! Their imaginations are more creative than mine too. Loved this! We started looking at ways we could recycle and do our part to take care of our environment last week! So far the kids are enjoying their lessons! These are great ideas that I can incorporate into our lessons! Pinning for sure! Awesome Brigette! I’d love to know what lessons you are using with your kids. I’m always on the hunt for preschool recycling activities! Thanks for pinning. You are welcome and glad you found these ideas useful! I’ve found that my kids are always watching, so what I do everyday is just as important as doing fun preschool recycling activities or crafts. For instance, we just cut my son’s jeans that have holes in them to make a pair of summer shorts. They really liked seeing that we could “make something old into something new”. Thanks for reading!